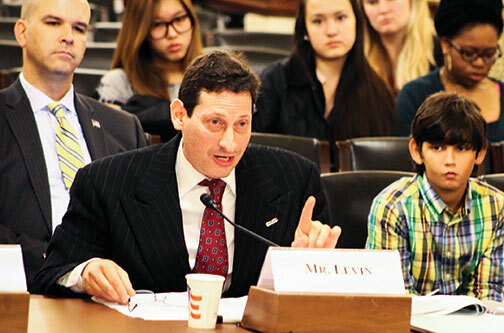 Class of ’87 | On October 28, Brian Levin C’89 testified before the House Committee on Homeland Security about the “diffuse” threat of terrorism in the 21st century. From commanded and autonomous cells to lone wolves and lethal duos, he told the committee, the hazards constitute a many-headed hydra. Thirty-five days later, a husband-wife team of Islamic extremists unleashed a fusillade of semi-automatic weapons fire on unsuspecting public-health employees, killing 14, before being killed in a gun battle with police. The attack took place right in Levin’s home town. Though he was out of town that day, his phone lit up with text messages as soon as the news got out. Media outlets quickly pressed him to explain the deadliest terrorist attack on American soil since September 11, 2001. He gave tempered responses, careful to ensure that his comments weren’t getting ahead of the investigation or jumping to the conclusion that the act was, in fact, terrorism. Nonetheless, the hallmarks were there. At the center, Levin has curated what he calls a “fiercely nonpartisan” clearinghouse that stresses scholarly collaboration and the collation of numerous data sources in its efforts to understand and combat extremism. His research serves as an important resource for policymakers. By tracking hate crimes against Muslims and working closely with other scholars and organizations such as the American Society of Criminology, Levin notes, the center was the first organization in the country to enumerate the rise of anti-Muslim sentiment in the United States. In the month after the November 2015 Paris terrorist attacks, Levin reported, incidents of suspected anti-Muslim hate crime in the United States tripled: from a monthly average of 12.6 in 2010-14 to 38. The proliferation of such acts, he suggests, has been fanned by politicians and talk-radio hosts alike. Levin provides a wide-ranging survey of extremist groups in the United States and beyond—from ISIS to home-grown movements, including militia groups like the one that occupied the Malheur National Wildlife Refuge in Oregon this past January. While mainstream conservatives have “genuine complaints” about the government, Levin says, the Oregon occupiers were “radically different” in that they were seeking change through force of arms against a government they view as having no legitimacy. Such groups spread their message via the internet, a potent source of foment. Social media help to influence angry, unstable, or disenchanted loners, as well as smaller informal groups, who “may sculpt idiosyncratic hatreds online, become operational, and even recruit with little external backing,” Levin says. James Nolan, an associate professor of sociology and anthropology at West Virginia University who was Levin’s co-editor on two recent editions of The American Behavioral Scientist focusing on hate and extremism, has high praise for Levin’s work and quality of thought. The two have known each other for almost 20 years. Levin’s intellectual interest in hatred and extremism dates back to his days at Penn. As an American history major, he took courses in African-American history and learned that numerous hate crimes were either not being reported at all or were poorly and inadequately prosecuted. He won a $700 grant to study racial violence, and under the tutelage of A. Leon Higginbotham Jr. Hon’75, the late federal jurist and Penn law professor, Levin’s dedication to studying extremism took off. He took leave from Penn in 1985 to become a police officer in New York City, working in Harlem and Washington Heights, thus becoming a third-generation cop in his family. When a back injury derailed that career, he went back to Penn and finished his undergraduate degree, then earned his law degree from Stanford Law School. Having worked as a corporate litigator and taught constitutional law at Seton Hall Law School, he knows his way around the legal issues as well as the terroristic ones.